The average social media job in 2016 doesn't pay as much as it did just one year ago, according to new salary data, but these 10 metropolitan areas offer the best wages for social media professionals. San Jose, Sunnyvale and Santa Clara, Calif.
San Francisco, San Mateo and Redwood City, Calif.
New York City, White Plains, N.Y. and Wayne N.J.
Oakland, Fremont and Hayward, Calif.
Bridgeport, Stamford and Norwalk, Conn.
Newark, N.J. and Union, Penn. Bethesda, Frederick and Gaithersburg, Md. Washington, D.C., and Arlington and Alexandria Va.
Suffolk and Nassau Counties, N.Y.
Hartford, West Hartford and East Hartford, Conn. 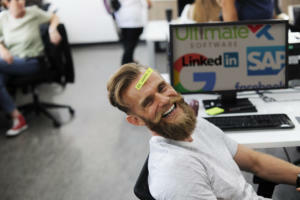 The average compensation for social media focused jobs declined in 2015, according to exclusive data from PayScale, a software company that performs corporate compensation analysis. 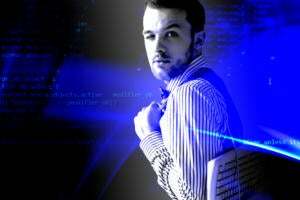 All of the leading metropolitan areas for social media jobs saw salary decreases, and the drop coincides with a national decline in the value of social media skills overall, according to PayScale, which tapped 54 million salary profiles to collect it data. 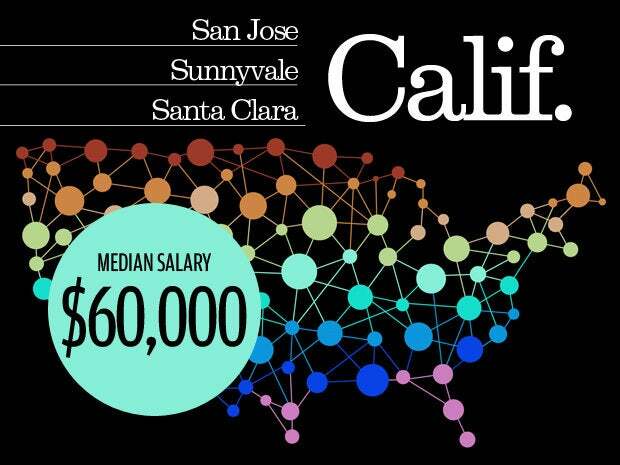 The highest-paying jobs for social media professionals are located in the heart of Silicon Valley, the metropolitan area that includes San Jose, Sunnyvale and Santa Clara, Calif. 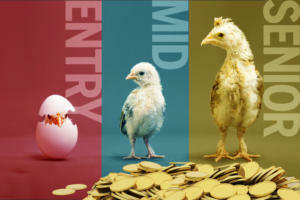 The region tops the list with median pay of $60,000, but that number is roughly 9 percent less than the area's median 2014 compensation. San Jose's per capita income in 2014 was of $34,992, according to U.S. Census Bureau data. For context, the U.S national average per capita salary was $28,555 in 2014. The San Francisco metropolitan area, which includes smaller cities such as San Mateo and Redwood City, had a 2015 median pay of $59,900 for social media jobs. 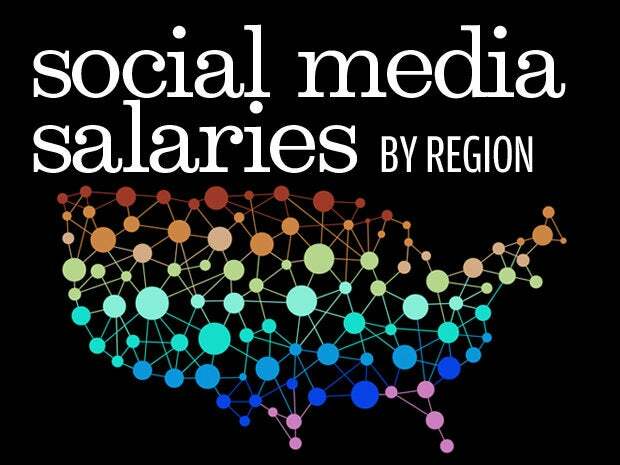 In 2014, the area sat atop PayScale's list of highest paying regions for social media pros. San Francisco's per capita income in 2014 was $49,986. 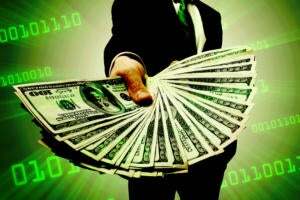 The greater metropolitan New York City area placed third in PayScale's ranking with a median social media salary of $56,700. 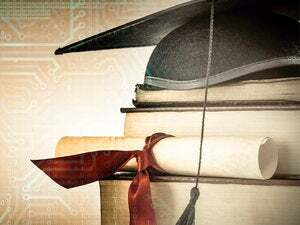 The region also took the third-place spot in 2014; however, the median compensation for social media jobs dropped nearly 10 percent year over year. New York City's per capita income was $32,459 in 2014. 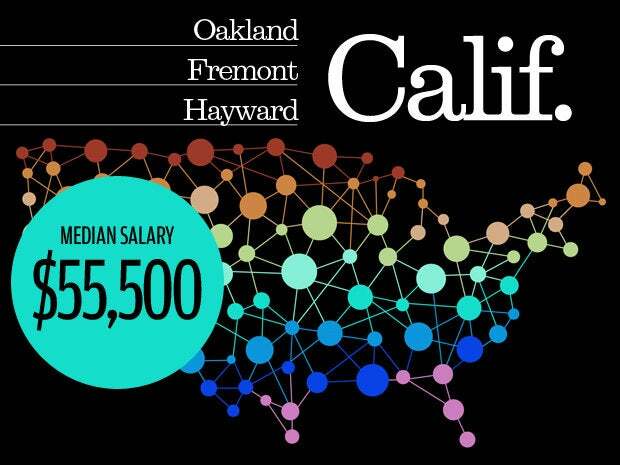 Social media professionals in the Oakland metro area earn a median salary of $55,500, according to PayScale. Oakland's per capita income was $32,566 in 2014. 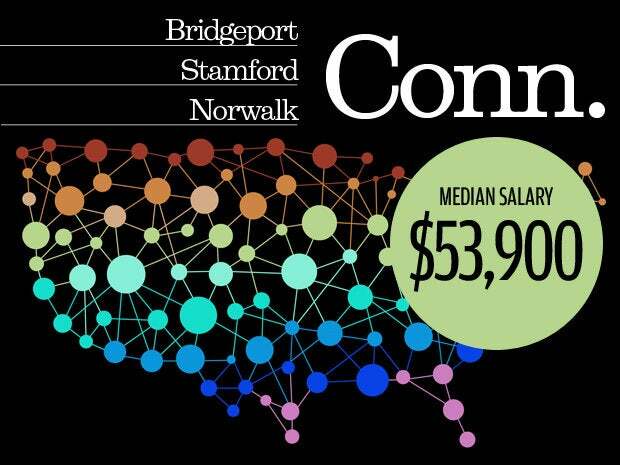 The median salary for social media pros in Bridgeport, Stamford and Norwalk, Conn., was $53,900 in 2015, PayScale says. Bridgeport's per capita income in 2014 was $20,442, making it the first city in featured here to have a lower per capita income in 2014 than the national average of $28,555. 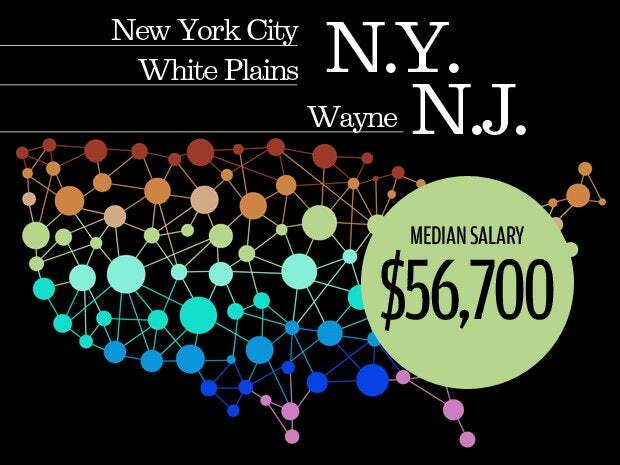 In the metropolitan area that starts just eight miles west of Manhattan, social media professionals take home a median salary of $53,800, based on PayScale's data. 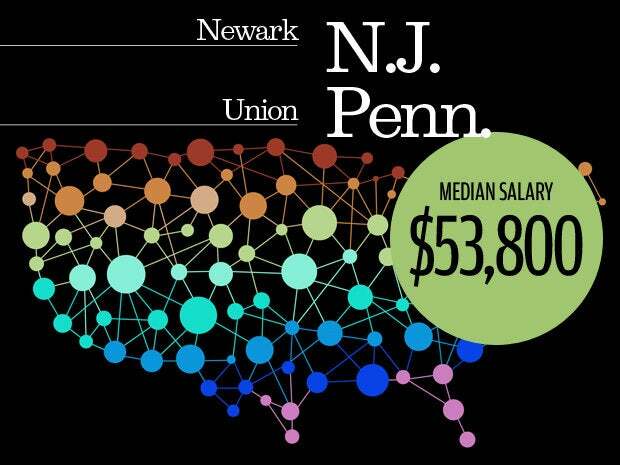 Newark, N.J.'s per capita income was $16,828 in 2014, or about half as much as the Big Apple's per capita compensation. 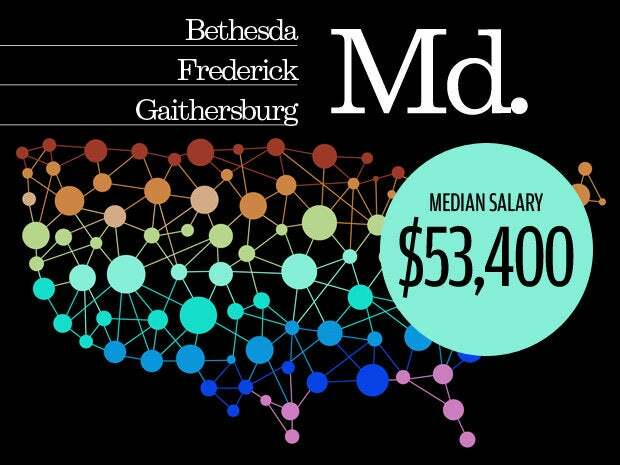 Bethesda, Md., one of the most affluent and highly educated communities in the country, and its surrounding metro area have a median salary of $53,400 for social media pros, according to PayScale. The unincorporated area northwest of the U.S. capitol had a notably high per capita income of $86,014 in 2014. 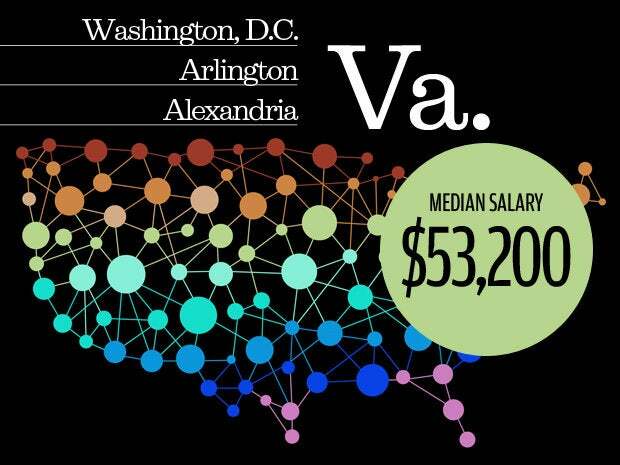 Social media professionals based in the nation's capitol and surrounding region make a media salary of $53,200, PayScale says. Per capita income in the District of Columbia was $46,502 in 2014. 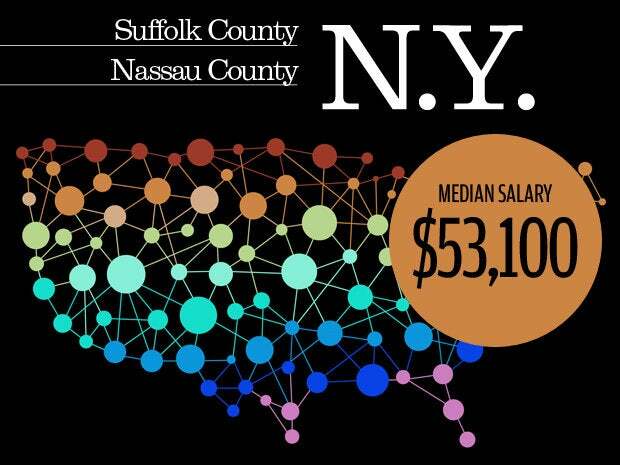 The New York state counties of Suffolk and Nassau have a median salary of $53,100 for social media pros, according to PayScale. The region's per capita income in 2014 was $37,427. 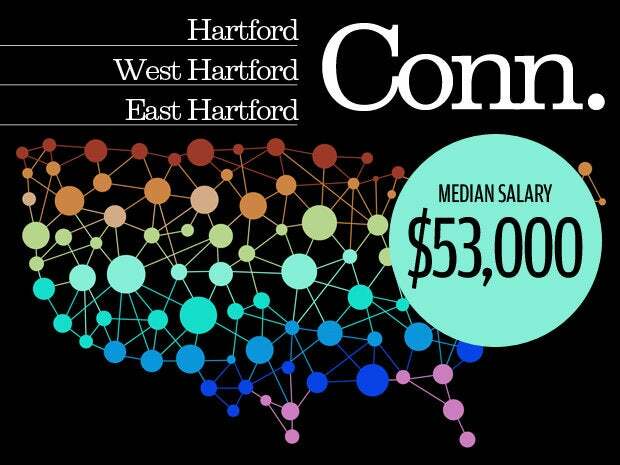 In Hartford, Conn., and its surrounding areas, careers in social media come with a median salary of $53,000, based on PayScale's data. Hartford's per capita income of $16,813 in 2014 is also the lowest per capita number of any of the top 10 metropolitan areas for social media salaries.